What a gratifying day I had. First, Lemme tell you how the day ended. 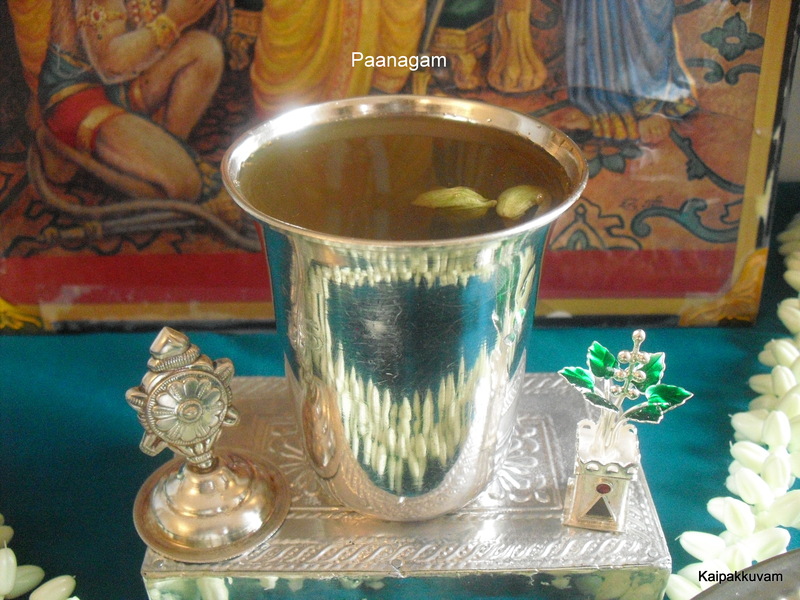 6 pm:- oil lamps are lit and the home smelt wonderful with the aroma of agarbathi. Sat in front of the shrine on a small mat and opened my Music notebook, sruthi box by my side. Started off singing Saint Thiagaraja’s wonderful compositions. My daughter was sitting next to me. 1. “Nee Dayaradha” in Ragam Vasantha Bhairavi set to Rupaka talam. 2. “Maakelara Vicharamo” in Ravichandrika in Aadi tala. 8. “Brochevaarevare Raghupathe” in Sriranjani. Now, is there a better way to end the day?- yes, by blogging about it ! Now, lemme tell you how the day started. After showering, Kept chanting “Ram” many times and started my “Neivedhya” preparations for the day. Sri Ramanavami commemorates the birth of Lord Rama– incarnation of Lord Vishnu . Rama was a righteous king who took a human form and was born on earth to fight Evil. He underwent all the sufferings of mankind. Ayodhya- the birth place of Ram would be bustling with joy and festivity during this season. People observe fasts, perform pooja, chant slokas, read Ramayana, sing bhajans and kritis and make special offerings to Sri Ram. 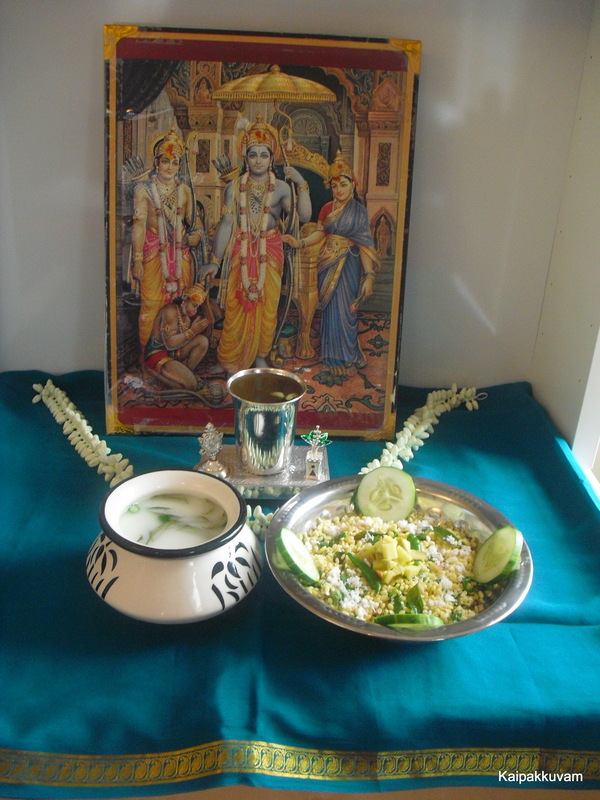 In South India, Paanagam, neer moar and Kosumalli/kosambari is offered to the God, however in NorthIndia, Sabudana kheer and kichidi are done and can be eaten as fasting food. 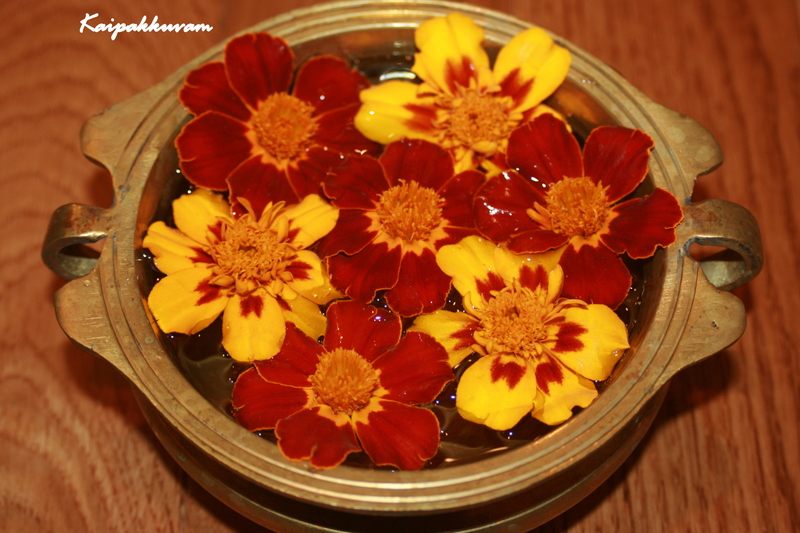 Paanagam: A deliciously aromatic sweet punch! 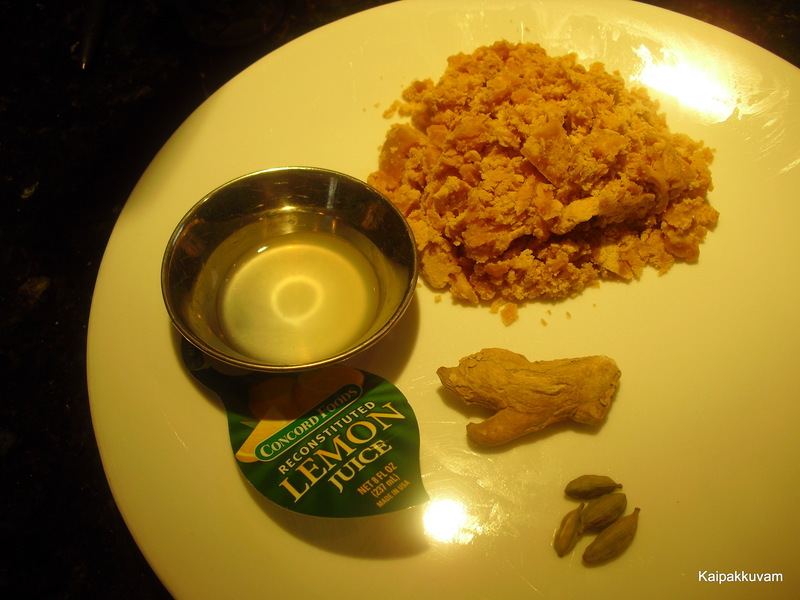 Dry ginger- Sukku- 1 tsp. Method: Dissolve the jaggery in water and strain all the sediments. Add powdered sukku, cardamom, lemon juice . Mix well, offer it to God and serve chilled! 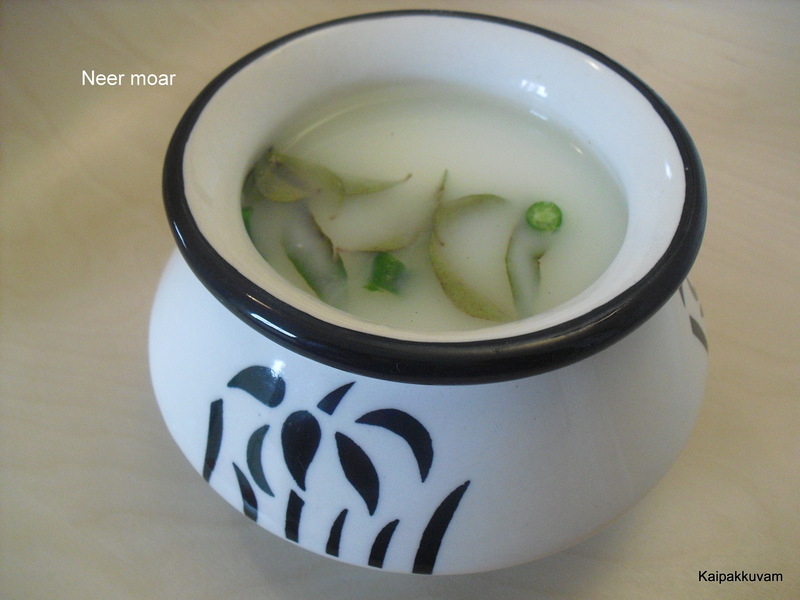 Neer moar: Neer moar is an amazing thirst quencher and a must during the summer months in india. Just like how we see “Lemonade stands” by kids in the US, most of the street corners would have “Neer moar stands” in earthen pots to keep them chill. It’s a heavenly drink! Mix the above ingredients, churn well and serve chilled! a hint of lemon juice can be added. 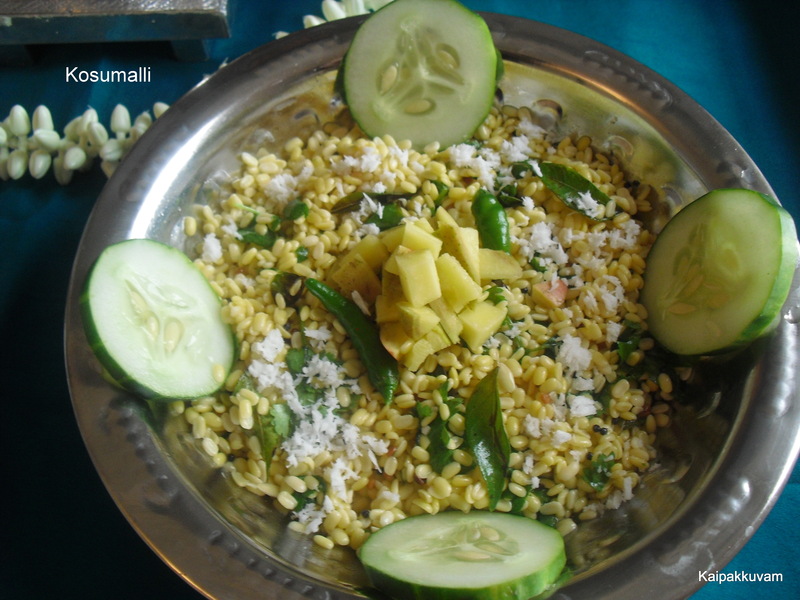 Kosumalli/Kosambari: Kosumalli is a quick salad that is made with split green gram. It is very healthy and easy to make. For Tempering- oil-mustard seeds, urad dhal, asafoetida, green chilly- 2 slit, curry leaves-few. Soak the green gram for 1 hour after thoroughly washing it. Add all the above ingredients to the soaked gram. Heat oil- 1 tsp and add the ingredients mentioned in tempering. mix well, offer it to GOD and serve it in a plantain leaf. Feels good to be back to blogging again. Thanks to my blogger friends for the motivation. 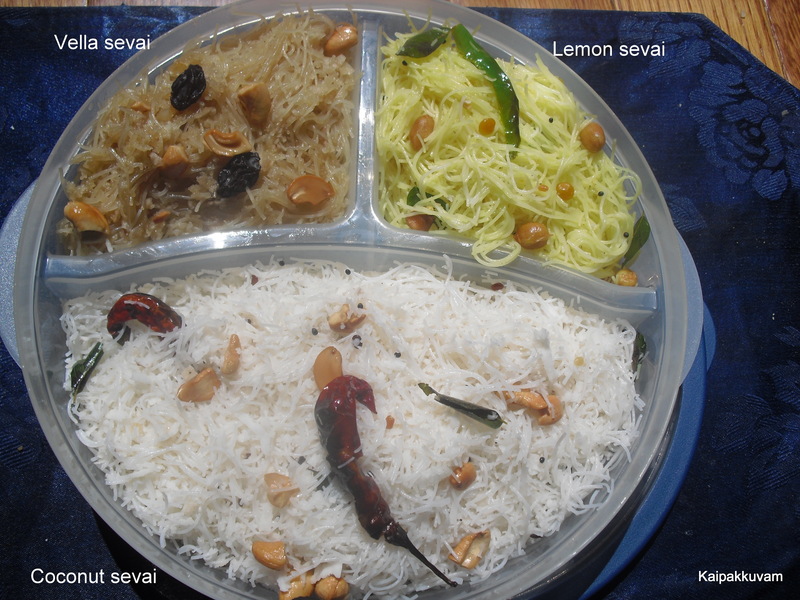 “Sevai” is a tiffin dish that can be done in a jiffy these days. I remember my mom making this for sunday evening tiffin. It’s quiet a project as it was done in a more elaborate fashion, from scratch. She would wash the rice, soak it for few minutes and dry it in a towel and powder it finely. Then cook it in a pan with , salt and few drops of oil and make rice balls and steam the balls in cooker. 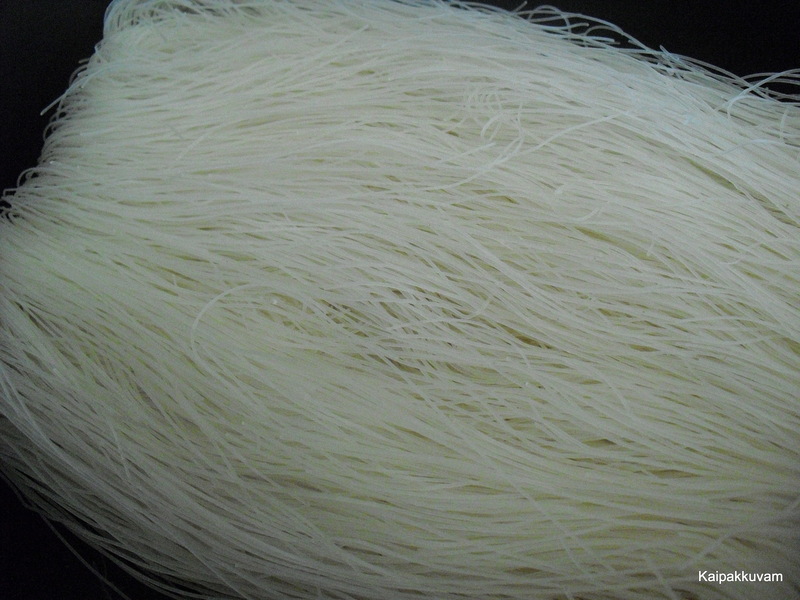 The steamed rice balls are then pressed in a machine called “sevai nazhi” to extract noodles and then seasoned with a variety of flavors and enjoyed as an evening meal on the weekends when the whole family is together. She would certainly ask my help to hold the sevai nazhi while she can turn the handle to get the noodles out of the nazhi. You can season them in a variety of flavors like Coconut , Lemon, jaggery-sweet sevai, Pepper-cumin(Milagu Jeera), Tomato, Chakarai(Cane sugar) sevai. Take water in a microwave container and heat it until the water boils. 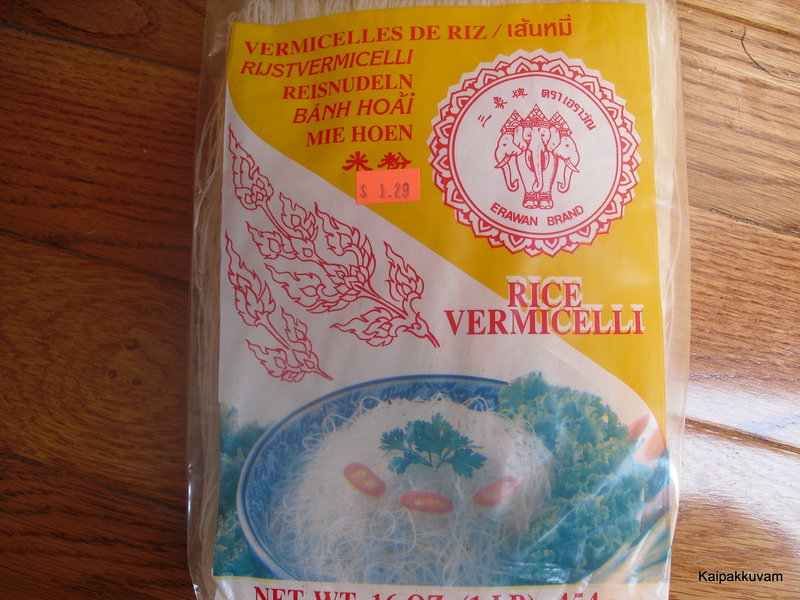 Remove the container from the microwave carefully and soak the rice noodles for 5 minutes and drain all the excess water. Season with a variety of flavoring and mix well. Enjoy with chutney or by itself. Heat oil in a microwave safe dish with ingredients 2-8 and microwave for 2 minutes with the lid closed halfway through. Then add shredded coconut and saute for 1 min in microwave. Add the microwaved contents to drained sevai , add salt and mix well. Lemon juice juice from 1 lemon. Add seasonings,salt and lemon juice, at last and mix the sevai well. 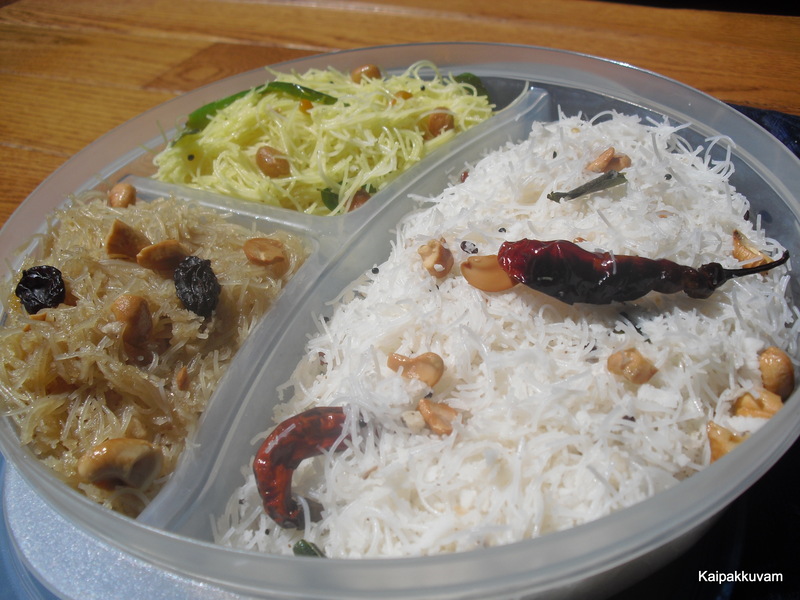 Add the jaggery and coconut in a microwave pan and mix for 2-3 minutes until it blends well. In another microwave dish, add ghee and cashews and raisins and heat it for a minute . Mix jaggery coconut blend to ghee toasted cashew and raisin and give it a gentle toss. Hmmmm. Now what should I say. This is one of the most delectable sweets I’ve had. A sweet version of poori’s made with all-purpose flour, dipped in sugar syrup with cardamom and topped with crunchy titbits of almonds, cashews and pistachios. Yummylicious! huh? Well, made this on my mom’s b’day and it was a huge hit. “Jeera” simply means sugar syrup. 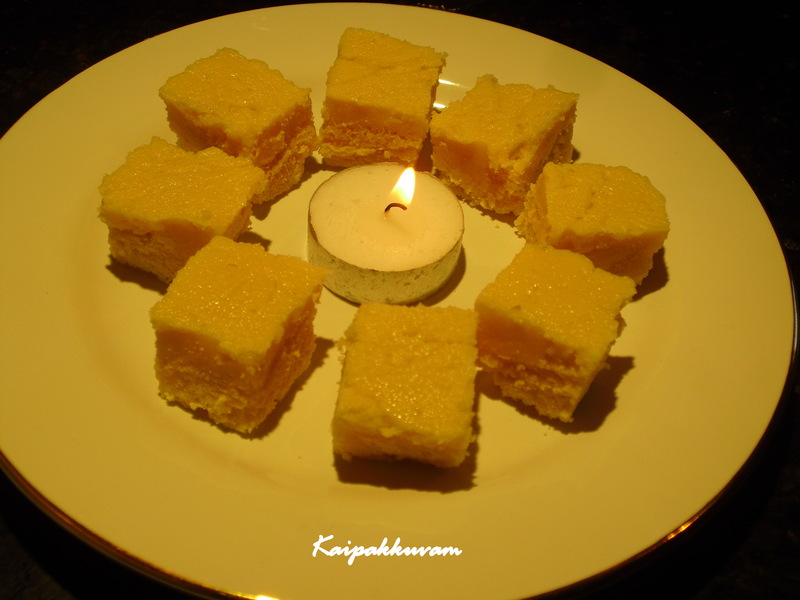 This is something you can do as part of your Diwali sweets or just on a sunday evening to treat your family with a sweet surprise. It is very easy to make, and sure would be enjoyed by everyone in your family. Oil for deep frying-2 cups. Almonds, cashews and pistachios- coarsely powdered- 3tsp. 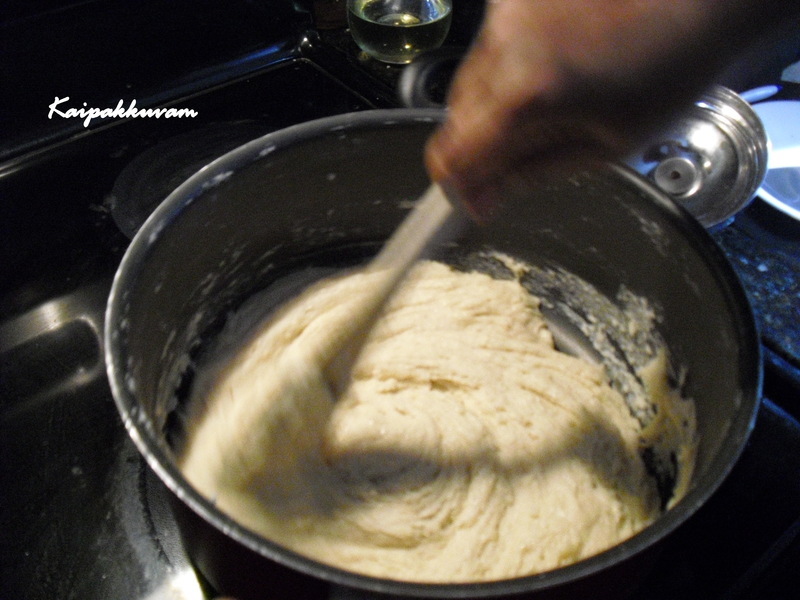 Mix maida with a little water and few drops of oil and knead into a dough. For Jeera(Sugar syrup): Add little watar to sugar in a pan and heat it till it forms 1 string consistency. Add cardomom powder and food color to the sugar syrup. Make small rounds, ( small lemon sized) in the dough and roll them flat like pooris with a rolling pin. Dab it with maida, just so they dont stick. Deep fry in hot oil one by one, till golden brown. 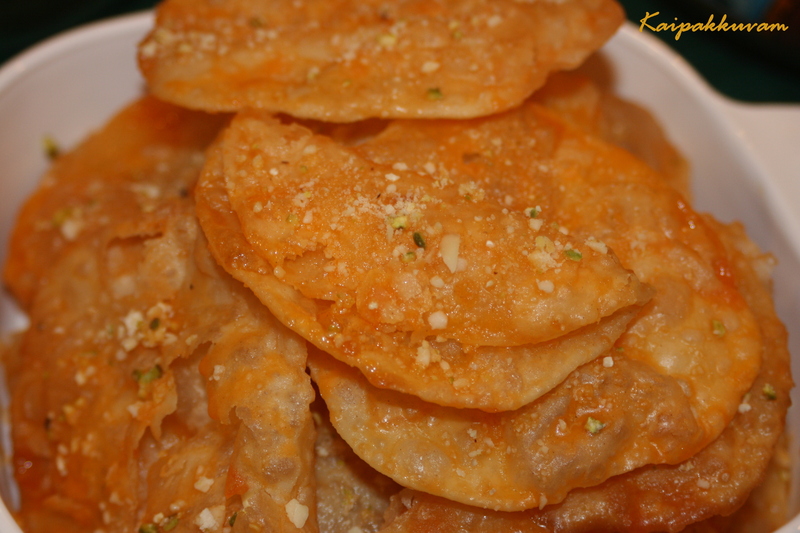 Soak the warm pooris in warm sugar syrup and arrange them in a platter. Garnish with crunchy titbits of cashew, Almond and pistachios. They can be served as rounds or can be folded into halves. The pooris have to be crunchy. So don’t soak for too long in the sugar syrup. While making sugar syrup, make sure, it doesn’t cross the 1 string consistency, otherwise the sugar may crystallize on top of polis. 2 tsp of Whole whea flour can be added to all purpose flour if you want the dough to be firm and easy to handle. Poori’s are wholesome whole wheat bread, that is an absolute favorite for both children and adults. 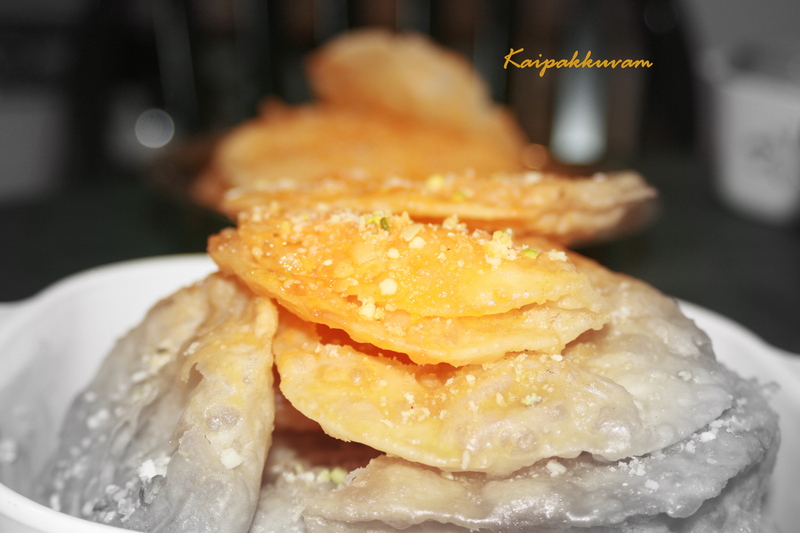 In south india, its customary to serve poori (puri) with madras masal, which is a potato based side to go with them. 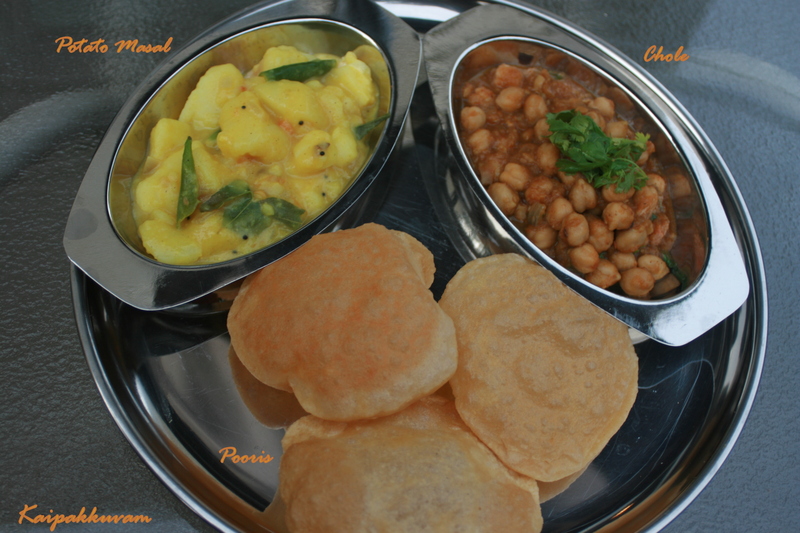 However in North India, Poori’s are served with chole or channa- a garbanzo bean side dish. Both of them taste very good. Though, I personally like the potato masal very much, I make masal and chole together to break the monotony and to make the dish a bit more interesting and grand. My daughter loves the poori’s. She simply enjoys it with sugar and ghee. Whole wheat flour (atta)- 2 cups ( will get about 15 poori’s). Water-just enough to knead the dough. Oil- 1/2 tsp- to knead. Mix wheat flour, salt, water and knead them into a dough. Add 1/2 tsp oil, so the dough doesn’t stick to your hands. let the dough sit for 1 hour. Make the dough into lemon sized small balls. Flatten them with a rolling-pin and table. Dab the rounds with atta(whole wheat flour), while pressing, so the rounds are not sticking to the rolling table. Gently slide the rounds in hot oil and deep fry them in medium heat. 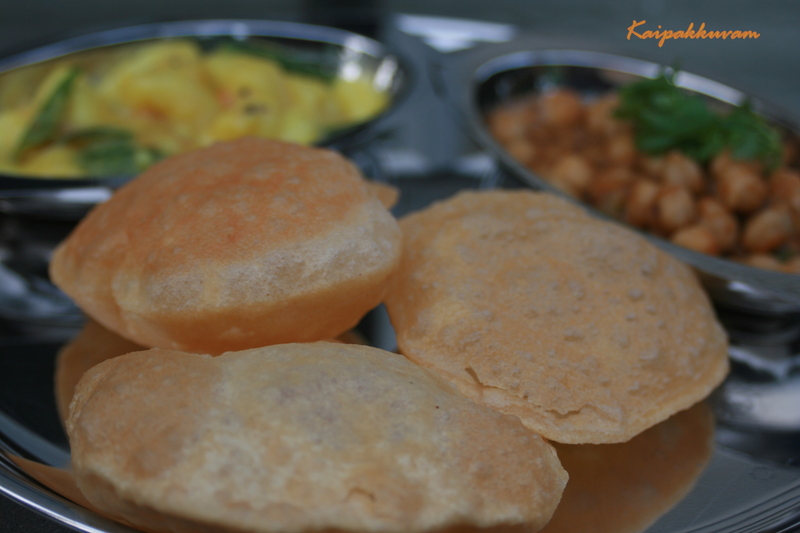 When one side gets cooked, topple it to the other side and gently give it a press to get fluffy poori’s. Absord excess oil with a paper towel. Serve hot with madras-potato masal or chole. Tip: Add water little by little while kneading, so you dont make the dough loose. Pressure cook potatoes, peel the skin and smash them. Heat oil in a pan and add mustard seeds. Once it splatters, add urad dhal, channa dhal, curry leaves, green chillies, Chopped onions and saute them. At this point tomatoes and peas can be added optionally and allow it to cook for few minutes. Add salt, turmeric and mashed potatoes. Add gram flour to 1/2 cup of water and add it to the pan. Simmer for 5-10 minutes and turn the heat off. White Garbanzo beans-1 tin cooked. Onion paste- from 1 big red onion. Tomato puree- from 2 tomatoes. Chole or Channa masala- 1 tsp. Coriander leaves and onion rings for garnish. Soak the Garbanzo for 8-10 hours and pressure cook till one whistle or use the ready made, pre-cooked tinned Garbanzos-but wash them well before use. Heat oil in a pan and add jeera, ginger garlic paste, onion paste and saute. Add tomato puree, salt, chole masala, red chilly powder, dhania powder and cook till oil separates. Add 2 tsp of curd at last and mix well. Another interesting variation in North india is “Chole Batura”. 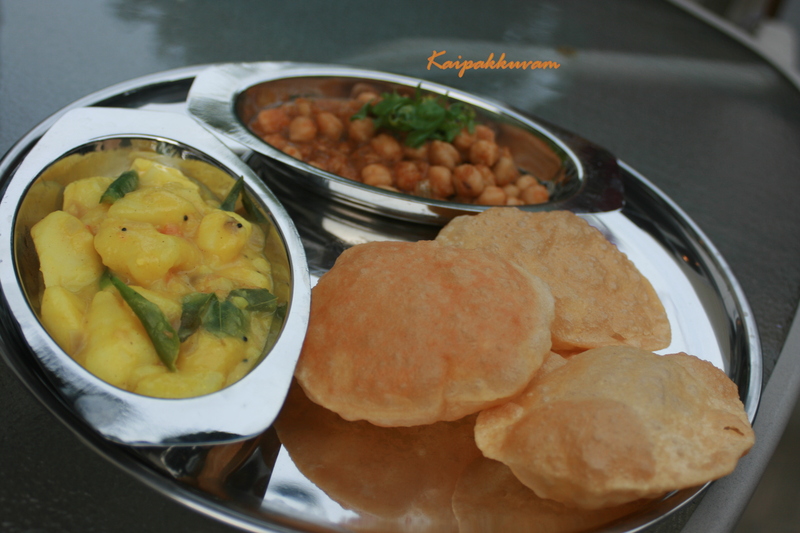 Batura is a large poori, which is also served with chole. But the preparation method is different. This is really an indulgence. My daughter goes nuts for this badam cashew cake / burfi. She can literally gobble 5 or 6 at a time. She calles it square sweet. But strangely she doesn’t like candies or chocolates. My mom always does this for her. Since mom is here, I wanted to learn this straight from her. Tried this on my hubby’s birthday and it came out pretty good. Wash and soak the Almonds (Badam) in warm water for 1/2 hour. Wash and soak the Cashews (Kaju) in warm water separately. Peel the skin from almonds and drain the water. Grind the almonds and cashew in a blender to a smooth paste, with 1/2 cup of fresh water. This should give approximately 2 cups of paste. To 2 cups of paste add 41/4 cup of cane sugar in a nonstick pan and turn the heat on. Allow it to cook while constantly stirring it. 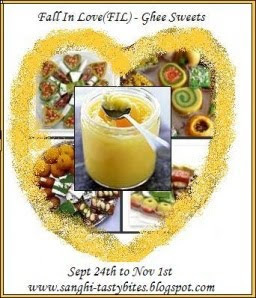 Ghee can be added slowly, while the paste is cooking. In about 20-25 minutes, simmer the heat and add the remaining ghee and carefully observe for consistency. There is a thin line between halwa and cake. When the corners don’t stick to the pan anymore and when you feel it’s crossing the halwa stage(loose setting) and starting to get more dense, it’s almost done and you can turn the heat off. When you cook more than this, it can turn very hard or get charred. 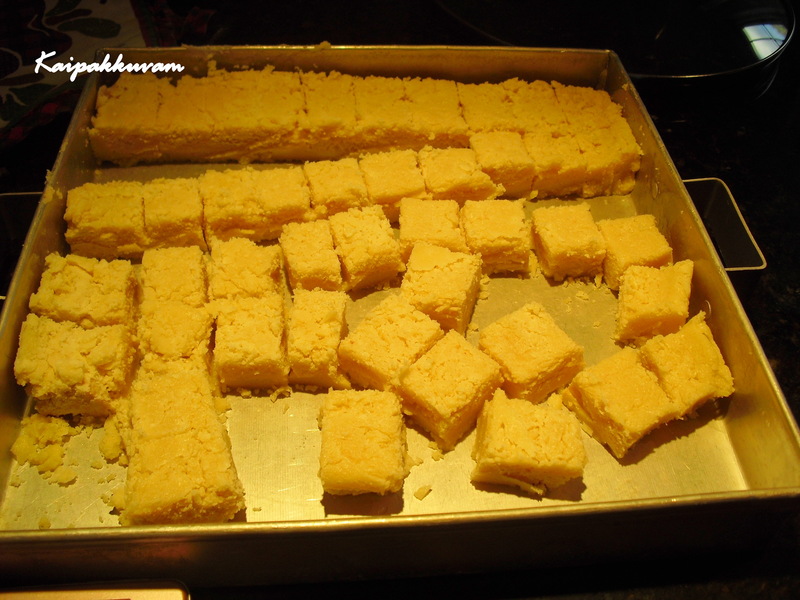 Quickly have a tray ready( greased with ghee) and pour the contents and cut them into little squares, when it’s still warm. Store it in a container,w hen it completely cools off. Since almond itself has a strong flavor to it, it is not required to add cardamom or any other flavoring. The consistency is really important. 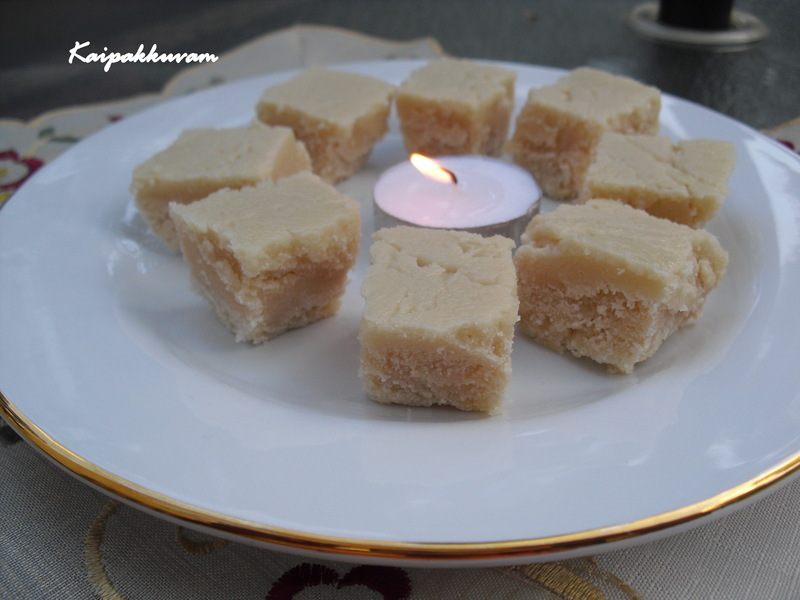 With practice, you will know, the difference between halwa consistency and burfi consistency. Make sure you buy plain versions of Almonds and Cashews (Do not buy salted or roasted). Every year during Halloween, I used to admire all those carved pumpkins adoring the doorsteps of neighbours and last year I decided to carve my own and found that was really easy and quick. 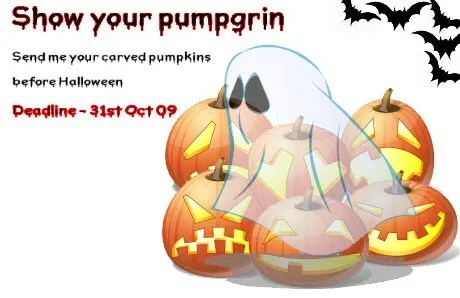 Although, my pumpkin is nothing fancy, it’s a pretty basic design, I came across this event “Show your Pumpgrin” in http://chefinyou.com/ and thought I should send in my entry. My daughter and I had fun making this Jack-o-Lantern and we took it to the Pumpkin fest event in Boston. Spoon to scoop the interior. 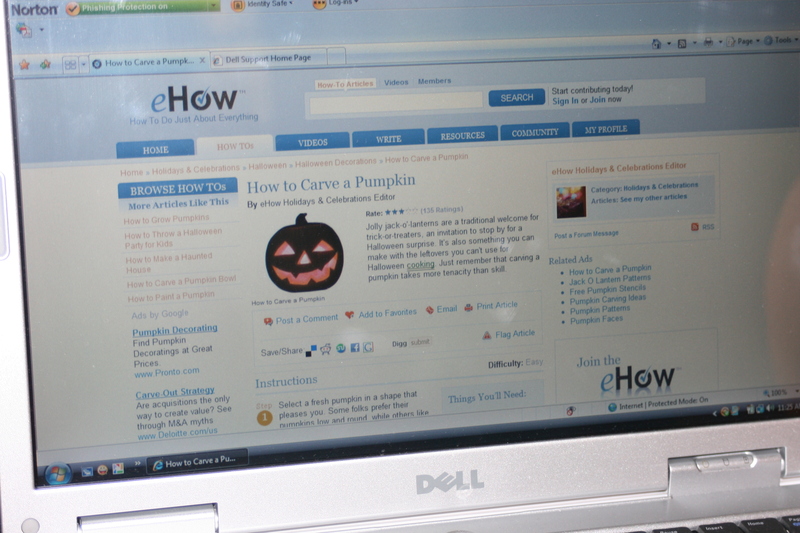 All I did was, type in google- How to carve a pumpkin and found on e how, easy step by step method to carve a pumpkin. 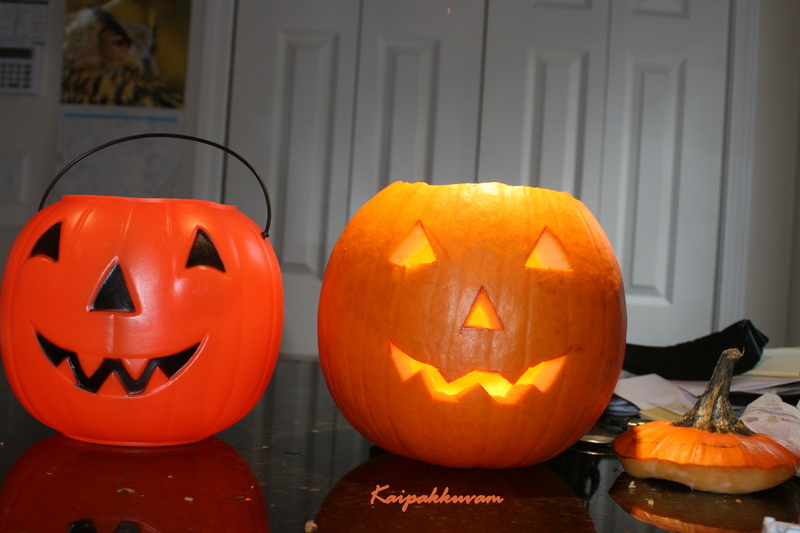 I followed these steps and walla, a beautiful Jack-o-Lantern it turned out to be…. Select a fresh pumpkin in a shape that pleases you. Some folks prefer their pumpkins low and round, while others like them tall and oval-shaped. Draw a circle or hexagon on top of the pumpkin in preparation for making an opening large enough for your hand to reach through. Cut through the stem end of the pumpkin along your outline with a sharp knife or pumpkin-carving tool. Use a back-and-forth slicing motion to cut through the thick, tough skin. Remove the stem end, which will act as a cap, making sure you scrape off any seeds or pulp. Use a large spoon to scoop out the seeds and pulp from inside the pumpkin. Hold the spoon by its bowl to get extra leverage while scooping. 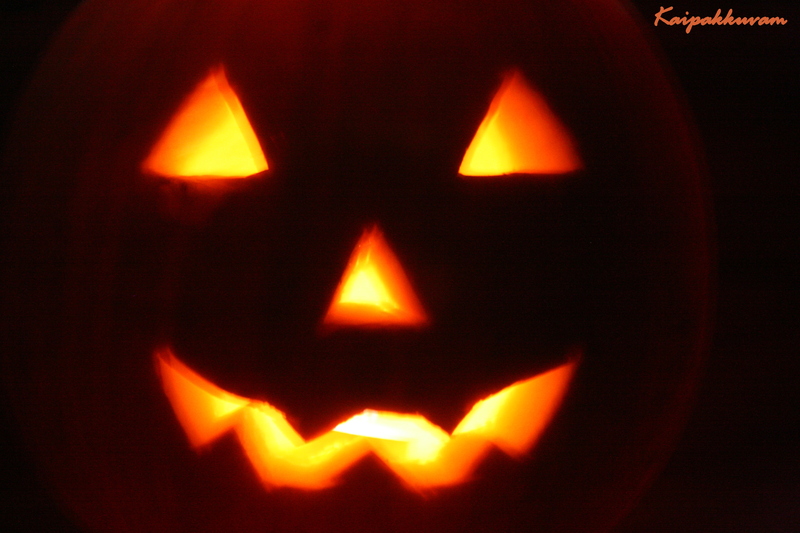 Draw a pattern for the face on the clean pumpkin with a felt-tip pen, or scribe the lines into the skin using a pencil. Be sure to make the eyes, nose and mouth large enough; you’ll have a hard time cutting out tiny features when you’re using a big knife blade to saw through tough skin. Follow your pattern as you cut all the way through the pumpkin. Push the cut-out features gently from the inside of the pumpkin and discard the pieces. 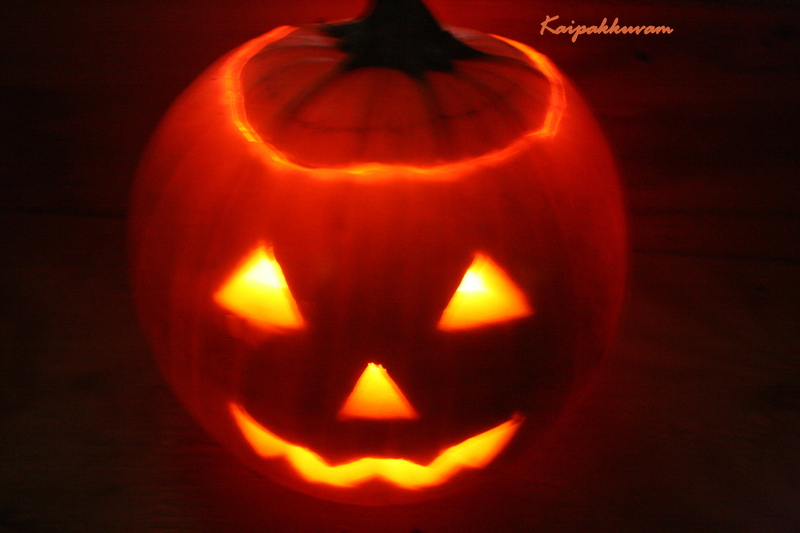 Place a votive candle inside the pumpkin to create an eerie glow. I happened to read “Sundara Gaandam from Valmiki Ramayana” for 5 days over the last month. My mom brought the book from India and was reading it. She suggested it’s very good to read Ramayana, especially Sundara Gaandam. Also my cousin Divya had sent me a beautiful handmade painting of Ram and Sita, done by her, as a present. Lot of good vibes. So, read Sundara gaandam in 5 days( about 30-45 min each day), and finished it on the the 5th day by reading Ramar Pattabhishekam( taking the throne) and Neivedhyam. 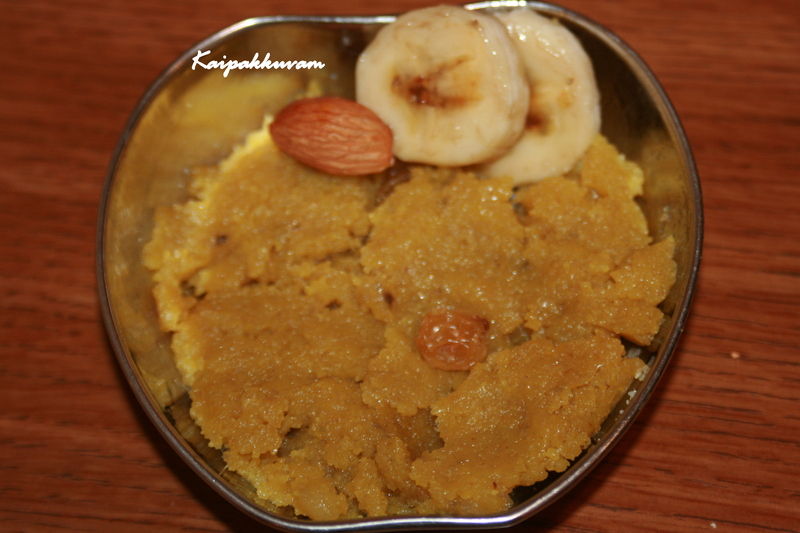 I offered Banana-Rava halwa, which is done during Satyanaraya pooja-vrath. There are several protocols on how to read them in 3 days, 5 days 9 days etc. It was such a beautiful feeling to read how Sri Hanuman flew to Lanka as a messenger of Rama, in search of Sita, who was abducted by Ravana. Sundara Gaandam describes, how Hanuman meets Sita and convinces her that Rama is on his way to rescue her and how he conveys the message and carries the souvenir from Rama to Sita and vice versa. I would read it in the morning and in the night tell the story to my daughter. She loves listening to Ramayana. It is believed, by listening or reading Sundara Gandam, one receives the blessings of Sri Ram and Hanuman. Ramayana is equivalent to Vedas. The word “Ra ma”is derived from the middle letter of “Om Namo Narayana” and “Namashivaya”, incorporating both Vishnu and Shiva to give Rama. While I was reading Ramayana, came across something interesting. 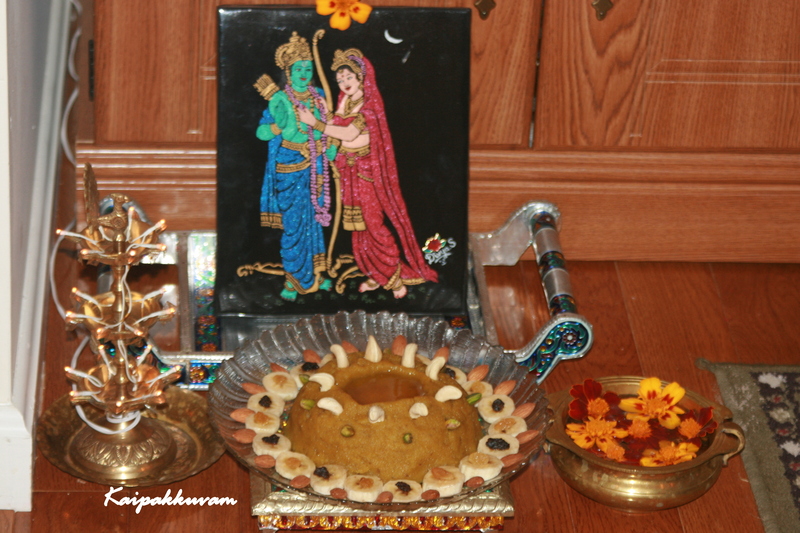 After the pattabhishekam, Rama once asked Sita, if she liked him or his story(The Ramayana). Sita replied that she actually liked his story more than him, the reason being, Sita was leading a miserable life in Lanka after being abducted by Ravana and was starving, feeling weak, tired and had no clue why Rama did not rescue her so far. She even had suicidal thoughts and that is exactly when she heard Hanuman telling Rama’s story from a tree above. She immediately left her suicidal thoughts behind and felt happy that her husband Rama would save her. That is why she liked Rama’s story more than him. Raisins and nuts to decorate-optional. In a pan, fry rava in ghee until a nice aroma comes and rava starts to turn light brown. Add warmwater, warm milk and chopped banana pieces to the pan and cook. When banana and rava are cooked, add sugar and ghee, cardomom and food color. When mixture leaves the sides, remove from fire. 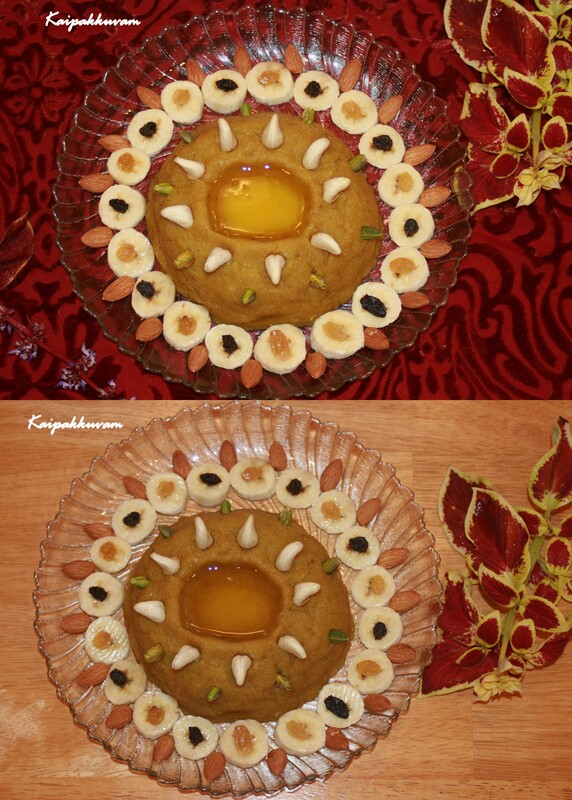 Tip: Select a firm, ripe banana for this halwa preparation. Do not use under ripe, over ripe ones. Nendhram pazham can be used for the same. Presentation Tip:Tried in a dark background. Felt like it was too busy. So tried photographing against a more neutral background and the dish looked much better and the attention went to the dish instead of the background. 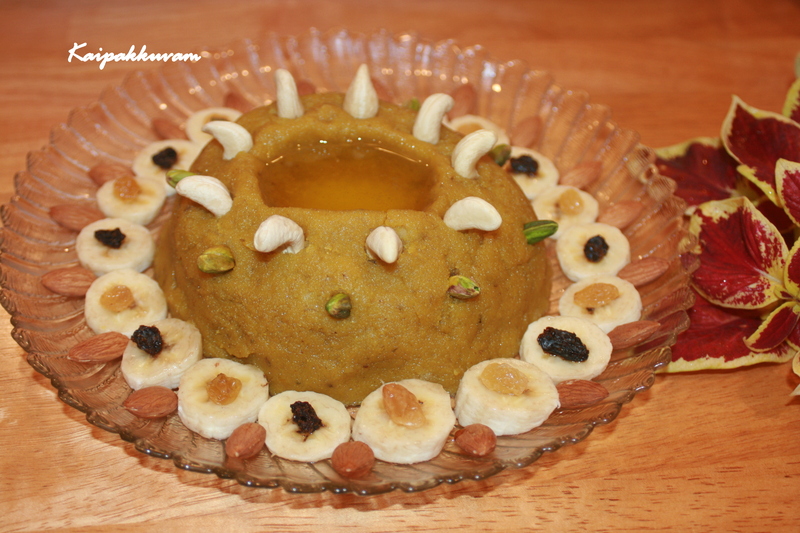 Garnish: Since the halwa was of the play dough consistency, I was able to mould it to a well. Filled with ghee(obviously only for garnishing purpose) and decorated with almonds, cashews, pistachios, raisins and banana rounds. 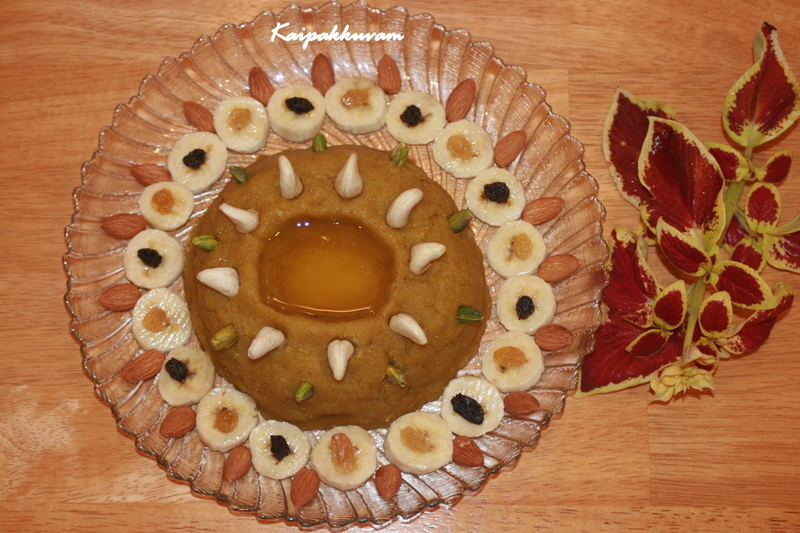 Sending this to Innovative Inlaws- Nithya and Pavithra http://innovativein-laws.blogspot.com/ , garnish the dish event.